Students train and place service dogs for people with mobility limitations and Veterans with combat-related injuries. 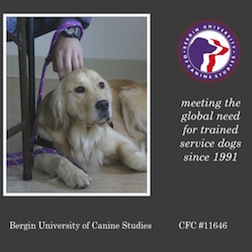 Bergin College of Canine Studies (AKA Assistance Dog Inst.) provides independence for people and a purpose for dogs. 13-year-old Makenna came to Bergin University of Canine Studies at the urging of her grandmother. It was apparent Makenna's health challenges would limit her ability to experience life as a young adult. Makenna needed a companion willing and capable to help her with daily tasks and to instill confidence as dogs do. When searching for service dogs, MaKenna's family chose Bergin due to the 25 year history of successful service dog placements. While Makena was super anxious to meet her future companion, she grew to appreciate the need for rigorous custom training to meet her life-style needs. Makenna needed assistance on household tasks, such as dressing, and getting dropped items or using light switches.After learning over 100 commands, Ming, the Bergin dog, was carefully matched to Makenna. From the moment she was born, Ming received hours of physical and emotional stimulation from dedicated staff and volunteers. As early as four weeks, Ming began hearing training terms and mastered basic commands soon after. At 12 weeks, Ming went to stay with her puppy host-family to experience a home environment. Later, Bergin University students took over her training - even housing her 7 days a week. During training, Ming went on countless field trips for exposure to different external environments from grocery stores, schools and on public transportation. When Ming and Makenna were brought together, joy was apparent and lasting. They became quite the celebrity team at school, which was life-changing for MaKenna. Their partnership is an inspiring example of the social bridge service dogs pave, combatting isolation that is so common to disabled persons and veterans with PTSD.